So, I guest-wrote a post over at They Call Me Blessed. Here is the post, enjoy! Downeast Homeschool Tour of Vanco Tulip Greenhouse! I went to school, I got excellent grades, I made lots of friends, and I was in extracurricular events. I loved school; well actually I loved learning. I needed to be busy learning and working on something new all the time. When I wasn’t occupied, I enjoyed chatting with friends around me, which would lead to me being in detention almost everyday of Grade 9 in our small community school (which was a fine trade-off for me, as I had no big plans for the 20-30 minutes of recess anyways). I then went to Memorial University in Newfoundland. I was definitely encouraged to pursue higher education, but not only that, I wanted to continue to learn. I finished university a semester early, just because I chose to take summer courses – because it was an option (and I loved learning!). University ended, I got my first “real” job but something was missing (once the training was over). I thought maybe I’ll do a Masters!? Then my newlywed husband and I found a leadership organization. For the next six years we subscribed to monthly books and audios and slowly and continuously improved ourselves both personally and professionally in a wide variety of areas. Check out some of my posts over at Joyful Eclectic Mama to see how this learning and reading impacted my writing.
. I started doing my research, which was so thrilling, because now I, myself, had something to dedicate by mind and heart into learning! Our second boy was born in January 2014 and by then I had been doing lots of fun activities with Oliver, our first. We read, we colour, we talk about everything under the sun – we create things. We travel all the time. We play. We had a friend hatch us baby chicks and adopt them and watch them grow. It turns out that while I was searching and searching for curriculum and trying to prepare myself that I almost missed the obvious, we are a family that just lives a lifestyle of daily education. It fits our personalities. We don’t do “bored” well. So we learn. Together. And that’s what I love most! We can sit down and read books that come alive off the pages, which leads us into discussing the how’s and why’s of the new worldly things this book has brought us. “Activity time” is a highlight for our boys; this is a semi-structured time during the day when we delve into the various hands-on activities we have created to help them learn colours, sorting, ABC’s, animals, the weather, along with fine and gross motor skills…and art, lots of art! They will sit and use small pincers to transfer and sort coloured pom-poms into labeled egg cartons. Our two year old knows his colours, shapes, and animals, he recognizes his and his brother’s names when written out, he can count to 15 unassisted, say his ABC’s and knows left from right 75% of the time. Our almost 4 year old was the same at that age and has continuously progressed, teaching his brother right along side. At no point did I set a goal for any of this for our boys. I just went along with their cues; offering them more or less as I saw their engagement change. This has come naturally in our daily lives. We travel to new provinces and states on vacation, and the boys notice differences and conversations begin. We hunt through used books stores for more “Curious George” books; of which bring many learning opportunities in themselves. We choose shows and movies with something to learn from them, like Curious George, Super Why, Leap Frog, Magic School Bus, or Sherman & Mr. Peabody; don’t get me wrong – Paw Patrol and Transformers have sneaked their way in there during weak moments and sick days, but they are only children once! 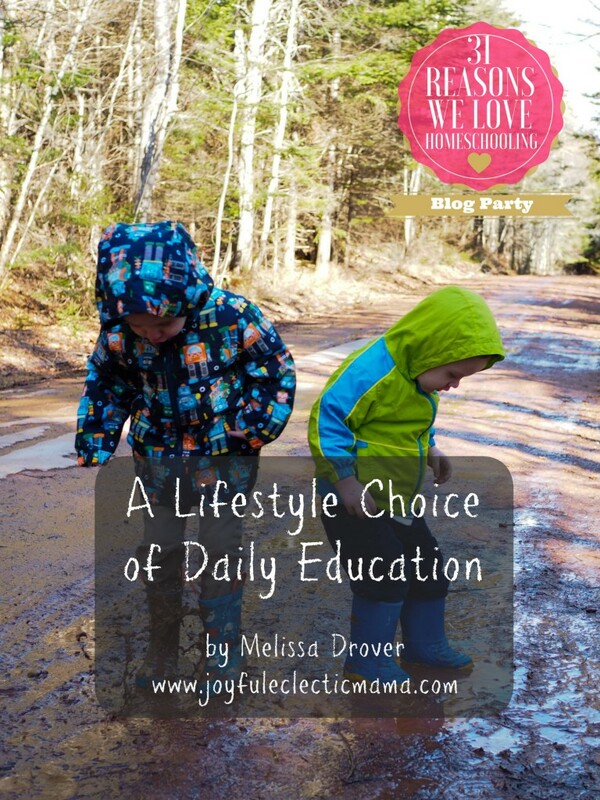 We live our lives and learning just happens to be everywhere, which is what I love most about homeschool; it just fits. Matt and I love to learn, to read and to discover, so naturally we want to include our children in this, as well.